First there was the Apple iPhone, a revolutionary phone with a touch screen. Then came an improved iPhone. Google soon followed up with their own version of touch screen phone - the Google phone. 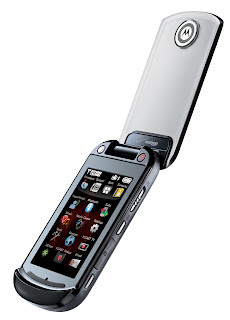 Nokia was next with their "Nokia 5800 XpressMusic". It took quite a while but the latest to join the fray is Motorola with their Krave™ ZN4. It features a transparent cover over a touch screen. Users can actually access several features without even opening the cover. It is expected to go on sale in the US on Tuesday for $149.99 on a contract with Verizon Wireless. No news about the UK though. I am not sure whether it has GPS though. No mention about it on their press release. I've read what other are saying about this new Krave and it does have GPS. Browser, GPS, touchscreen, etc. Looks like a great buy for anyone on Verizon. I'd wait though, you know there's bound to be some 50% promotion around the holidays. Price should drop pretty far in the next month of two I think. That's a pretty impressive phone, but I don't think anything will be able to match the iPhone; not even the Google Phone. But who knows what will happen, they're always innovating new things every day. Very cool looking phone but I think it will have a hard time competing with the new iPhone, the new Sidekick, and the new Google phone. Very cool phone!! I too got a motorola phone...presently..! Motorola makes a great phone. I have the Q and have had very few problems with it. Too bad the Iphone is getting so much attention. The touch screen mobiles are now getting normal. I hope in no time all the cell phones will have fully of partially touch screen system.